It probably wouldn’t have occurred to me to throw “The Losers” into that list. Well, okay, maybe those books aren’t exactly what he was asking for…but hey, close enough. 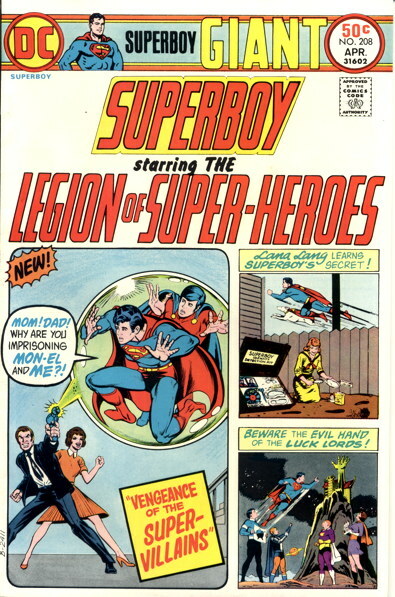 The Sensational New Character Find of 1965! Well, that certainly seems entirely practical. 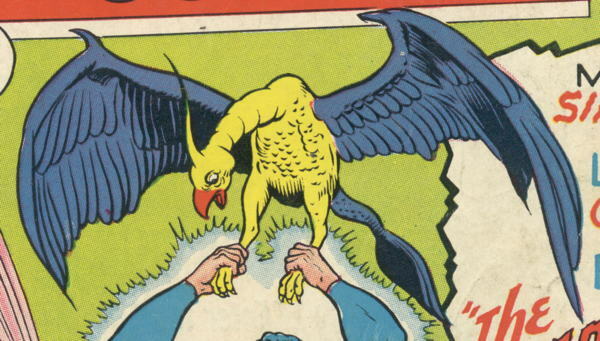 A few decades too early for all those Elseworlds comics, kid. 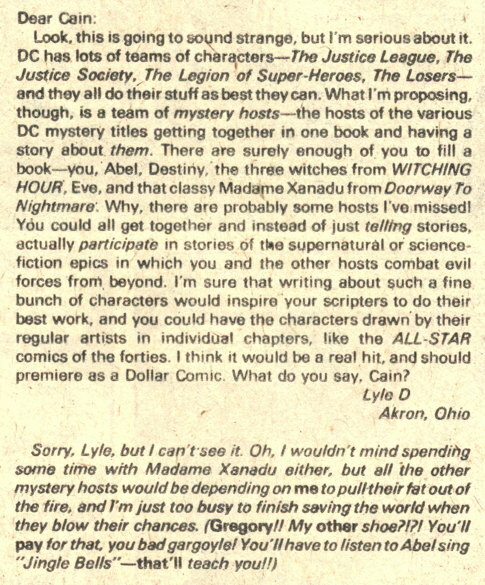 A letter from DC Comics’ World’s Finest #192 published in March 1970, a few years before Marvel Comics put out What If? 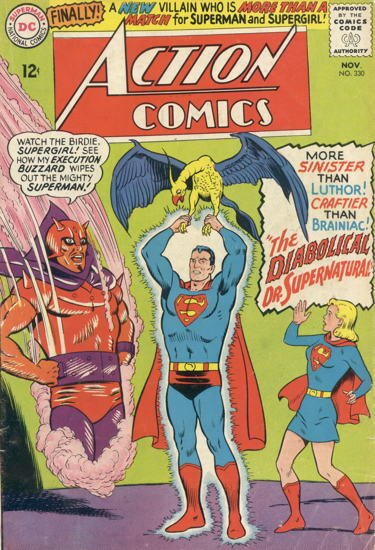 #1, cover-dated February 1977. I’m trying to picture this issue of What If? with those other titles. “Conan…walking the Earth of today? IMAGINE THAT!” Or “What’s NOT Happening? Any more Conan comics from Marvel!” Or, you know, something like that. One of these days, 142-year-old Nugget Pete is going to ego-surf his own name through Google and find this post. So a couple of weeks ago I was talking about a Sugar and Spike story dedicated to “Nugget Pete,” a 90-something year old gent who’d been writing in and requesting an S&S story featuring Native Americans. Well, longtime Ruinite C. Elam popped into the comments on that post to drop in a couple of message board links giving us a little more detail on Mr. N. Pete. Those message board entries were made only days after my own initial posting, so clearly the Nugget Pete zeitgeist was making its way across the comics nerdinet. The first features a Sugar and Spike letter column containing what seems to be Nugget Pete’s first letter to the series, written back when Pete was but a strapping young lad of 87. And, sure enough, he’s asking for stories with Native Americans. “I suggest you put in something about cowboys and Indians – That never hurt a magazine yet.” …Words to live by! 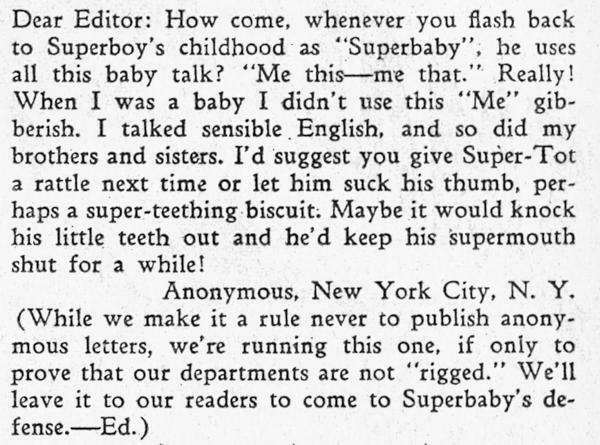 Anyway, that was a nice follow-up to what was (to me, anyway) an interesting tidbit of funnybook history. Thanks, C. Elam, for pointing that out to me! I sometimes get emails just like this. 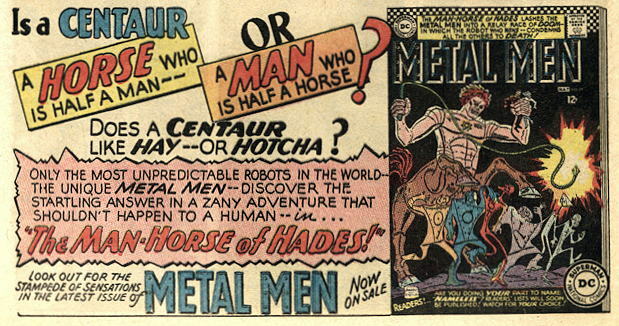 I vote “hotcha.” I mean, who doesn’t like hotcha? …that seems like something of an…extreme response. …count the number of civilized men at the San Diego Comic Con. I suspect there will be an equal number of headbands and neckties. Probably not from John Constantine. Well, I don’t know about you, but I’d totally be in favor of an “Adventures of Alec Holland” series. In fact, in a way it looks like we might be getting a little bit of that in next week’s final issue of that one series I don’t want to spoil by mentioning that Swamp Thing may or may not have made an appearance in the previous issue. We’ve had the occasional Alec Holland adventure in the various Swamp Thing titles, usually when he reverts (or imagines he reverts) to human form, like in the last issue of his original series and the couple of Challengers of the Unknown issues which followed up on those plot threads. 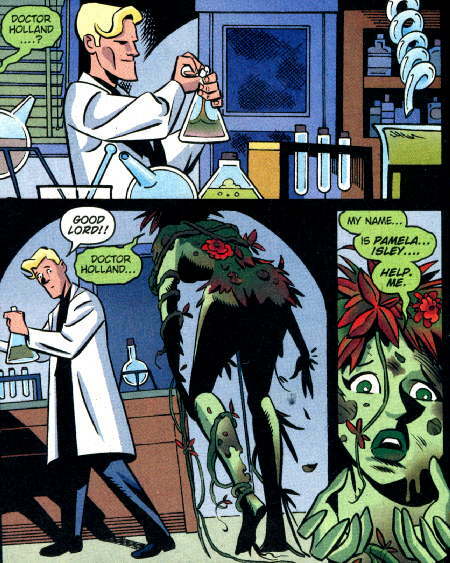 Alas, at no time was there an animated universe Swamp Thing to go with our animated universe Alec Holland, aside from some sneaky cameos in the Justice League cartoons. As an aside…there sure were a lot of typos in that Challengers letters column. In the scans you can see “there” used in place of “their,” and “permanently” spelled “perminately.” Not shown: “November” spelled “Nobember.” By the way, I was going back through some of my older posts as I was writing this and quickly spotted several typos of my own, so I’m not taking the high road, here. And if I may quibble a bit with the original letter writer’s point…Holland didn’t spend “his whole life looking like that.” Even in real world time, as opposed to however much time allegedly passed in the comics, Holland had only been Swamp Thing for about six years at that point. So let’s not exaggerate, Guy Who Wrote in to Challengers of the Unknown 30-Plus Years Ago!